Malvin Artley, our regular esoteric commentator, discusses the meaning of the New Moon in Cancer for 2010, which is also a total Solar Eclipse. The New Moon in Cancer takes place on the 11th of July 2010 at around 19:42 UT (GMT), which is 5:42 AM, July 12, Sydney time. Since Malvin is writing in Adelaide, South Australia, his time and date is ahead of GMT. The date of the eclipse in the US and Western Europe is therefore July 11. It is a blustery day in Adelaide as I sit and write this, two days out from the coming eclipse. The weather is pretty descriptive of what I see around that event on Monday—storms first and then a cleansing rain. I like weather like this. It is good for reflection, especially with all the white noise it generates, or to spend with loved ones, or just to curl up with a book, if we remember what those are any longer. A couple of days ago I got clear indications of the energies this eclipse involves and we will get to that in due course. Aside from that, though, I wanted to have a further look in this letter at the state of the world, especially the US with the economic ups and downs and the now oily waters of the Gulf of Mexico. I find that with eclipses and other major astrological markers it is helpful to look back on what was going on in life at the time the same events happened previously as a sort of gauge and an indicator of what to expect, so the past week or so has been a reflective time for me and one full of astrological research into cities, states and nations. The word 'eclipse', aside from the obvious current movie craze, often conjures up feelings of dread or apprehension in people, but I can say here that the Monday eclipse will not be so potent as the one 19 years ago to the day at almost the same degree. As we have seen from past letters, eclipses are not simply one-off events. They 'hang around' for several years and we get reminders of them as planets transit over the eclipse point or the point directly opposing it. That is why I go on about them from time to time because events will get triggered off by the subsequent eclipse activations. I have seen that time and again. Often it is not the eclipse itself that brings about events. The post-eclipse activations are the real worry or agents of blessing and change, especially if the activating planets are 'outers' (from Saturn outward). With the state of the world at the moment and with the big events and instability in certain areas, it is good to have a heads-up about what might be coming so that we might plan ahead a little and gain a bit of insight into the subtle energies impinging upon us. So, without further ado, let's have a look at the upcoming eclipse. The solar eclipse of Cancer 2010 takes place on 12 Jul 2010 at 5:42 AM AEST (11 Jul 2010 19:42 UT). It is a total eclipse, but will only be visible from the southern part of the Pacific Ocean. It is a member of the 146 Saros family of eclipses, which began on 19 Sep 1541. That series is marked by uncertainty in loyalties, a need for reassurance, fickleness, but also the ability to move through that and further cement bonds as a result of emotional trials by fire, so-to-speak. This eclipse is the complement to the lunar eclipse we just had (and it was a lovely one to watch here in the southern lands). The proving or disproving of ideals and attachments is a key theme with both of these eclipses, but particularly with the one under consideration. This indicates a marked disillusionment, hopefully of a positive sort, and it will eventually bring healing, although a 'healing crisis' will be in evidence first. The first eclipse of the 146 series had a stellium in Libra, with Venus at the midpoint of Mercury and Saturn, with Neptune opposing, indicating the disillusionment. However, Mars was in sextile to Saturn (rebuilding and building for the future) and Venus was in applying sextile with Uranus (help from unexpected sources, unusual alliances and sudden insights). Mars and Uranus were conjunct then, further highlighting the suddenness of events, independence of thought and action, and the healing crisis. Venetian gondoliers giving a serenade. This festive symbol would appear to be in stark contrast to the somber tone represented by the Saros series. It would also seem to be contraindicated in the figure for the present eclipse, with the t-square on cardinal points and the Saturn clash with Chiron and Neptune, both of which are opposed by Venus, and with that same Venus/Neptune opposition being a feature of the first eclipse of the 146 series. 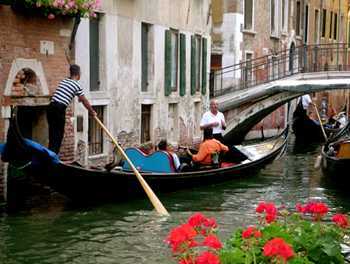 No, the image of singing gondoliers just does not seem to fit with present astrological conditions. What exactly is there to sing about in the world? Well, there is much more to this symbol than singing and romantic images. Water is always a symbol for emotions and life in general. As Dane Rudhyar in An Astrological Mandala has rightly pointed out, Venice is a city that literally sits on top of the water, like a lotus risen form the muck and mud of the pond. What this symbol is really trying to impart through this eclipse is the idea that, instead of getting lost in the water (life in general) and the twists and turns of the city canals, we should rise above any emotional concerns, keep our course firmly in mind and use the oar of calm-abiding to see and propel us through. This symbol is a distinct reminder of the happiness that can be had when one conquers inner turmoil and gets on with life unperturbed by the surrounding karma working out. To use an analogy, water is not an obstacle if we have a sound boat and a good oar. The 'boat' and 'oar' in this case are simply whatever techniques we have to place the mind in calm and focused state. In the eclipse figure the Sun and Moon are in a close sextile with Mars which accelerates anything that comes up around the event or its subsequent activations. That sextile can be a bit overwhelming for people, but if the eclipse falls on planets or angles of your own chart be assured that you will have whatever energy you need to work through whatever challenges the eclipse represents. At the same time, though, we do not want to overwhelm those around us who may not have anything they have to particularly work out as a result of this lunation. There is no eclipse lord by conjunction in this figure, but Neptune is the esoteric ruler of the sign the eclipse falls in (Cancer), thus making that planet, along with the Moon (the orthodox ruler), the lords of the eclipse. The Moon and Neptune both rule over the oceans, hence we would expect some kind of events associated with the oceans or big water, and both planets have dominion over the emotions in some way. The general state of the emotions in this chart is not exactly happy. Although the Sun/Moon conjunction is well-aspected to Mars, Venus (the other indicator of emotions) is opposed to Chiron and Neptune, as has been mentioned. Also, there is a classic Magi heartbreak clash with the Saturn linkage to Chiron and Neptune. However, Venus is trine to Pluto and linked with the Jupiter/Uranus conjunction, indicating powerful magnetism and help. People will be there for us if there are trials to come from the eclipse. That conjunction is part of the t-square mentioned before, however, so its benefits to Venus depend upon how the rest of the t-square impinges upon it. Regarding water and the emotions in connection with this eclipse, I had a look, as I previously mentioned, over the past week at various countries and some of the states within the US. There is a fair amount of spin going around on the net about the possible ramifications of the spill in the Gulf of Mexico, and I wanted to see what the astrology showed around it over the next few months, if not years. It was quite interesting, especially with regard to the southern states along the coast of the Gulf, and I will get to that in a moment. There was one particularly dire possibility that has been mentioned on the net that bore investigation, and that was that the cracks appearing in the rock seams surrounding the oil volcano might theoretically trigger an earthquake in the New Madrid seismic area in the Bootheel region of Missouri. The New Madrid Quake of 1811 was the most powerful earthquake ever recorded in the US and there were over one thousand quakes in that area from 1811-1812, to the extent that a lake was created due to the shifts in the earth's crust in that area (Reelfoot Lake). The Mississippi River runs through that area and it was actually seen to run backwards at one point during the quakes. According to one source, earthquakes in the New Madrid region have their origin in the Gulf. Whether the Deepwater Horizon event will cause a quake in the New Madrid region is debatable, but I will tell you that my preliminary astrological investigations do not show that a major quake in the New Madrid seismic area is immanent-certainly not in the State of Missouri. Instead, what I see is a great amount of upheaval for the Gulf States, especially with regard to the populace, the national mood and agricultural issues in the area. The general theme that runs through the states that lie along to Gulf of Mexico for the next year or so is one of general discontent and public outrage. It is fairly obvious anyway, is it not? Tourism is a big draw to the Gulf as well as the fishing industry, and if the water is fouled with oil it tends to put a damper on people's holidays and jobs in that region. I don't mean to seem flippant here. I see a particularly difficult period in store for Louisiana and Mississippi, with major solar arc activity from Mars and Neptune for Louisiana and Saturn to the Descendant of Mississippi. I do not, I should reiterate, see a major earthquake at this time, although I do not have a foundation date for New Madrid, MO, only the year (1808). Interestingly, San Francisco is in for major events in 2012-2014 with first Mars and then Saturn progressing to its horizon in that period. The eclipse will affect the Gulf States of Mississippi, Florida and Texas via the Moon in their charts and New Orleans via its Chiron. New Orleans had Neptune on its ascendant by solar arc when Katrina passed through and it will have Mars on its meridian in a couple of years. It might interest astrologers to know that the Moon of the Deepwater Horizon event was conjunct the MC of the New Madrid Quake (22 Cancer), not that there is any physical connection, but the real point to be made here is that the few degrees on either side of this eclipse are strongly indicated in both events and several US states. In fact, the third quarter of Cancer seems to figure powerfully in major world event charts, especially bombings and disasters. In part two of this article, Malvin concludes his discussion of the New Moon in Cancer for 2010, a total Solar Eclipse. He looks at the personal consequences of the eclipse, as well as the social issues associated with it, notably the Gulf Oil Spill and its ramifications. Read part two of The 2010 Solar Eclipse at the New Moon in Cancer.